Born in Jacksonville, Florida, USA. 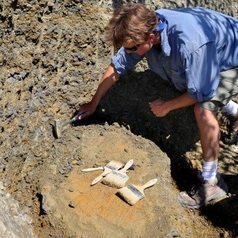 Has nine summers of field experience excavating dinosaurs, as well as many years of prep-lab experience. Attended Princeton University from 2010-2014, earning a bachelors degree in Ecology and Evolutionary Biology (Adviser: Dr. James Gould). Undergraduate thesis was entitled "Paleobiology of North American stegosaurs: Evidence for sexual dimorphism". Masters thesis in Palaeobiology at the University of Bristol in 2015 was entitled "The taphonomy of keratin in archosaurs" (Adviser: Dr. Jakob Vinther). PhD thesis in Geology at the University of Bristol in 2018 was entitled "The taphonomy of soft tissues and the evolution of feathers" (Advisor: Dr. Jakob Vinther). Currently a post-doc at the Field Museum of Natural History, Chicago, Illinois, USA (Integrative Research Center).